Korn have released a short teaser video for their track Black Is The Soul. The song originally appeared on the band’s most recent album The Serenity Of Suffering which came out in October last year. The full promo is expected to launch later today, with the brief clip showing Jonathan Davis, James ‘Munky’ Shaffer, Brian ‘Head’ Welch, Reginald ‘Fieldy’ Arvizu and Ray Luzier along with a mysterious, faceless woman. 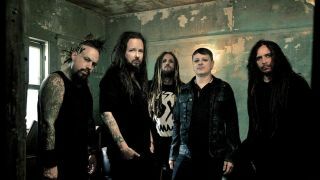 Korn were forced to postponed a run of tour dates last month but will continue their live dates as planned from June 12 including an appearance at the Reading and Leeds festivals. Find a full list of their upcoming shows below.